Hi, everyone! So excited to be sharing the darker color in this cardigan (you can see how I styled the lighter color here). 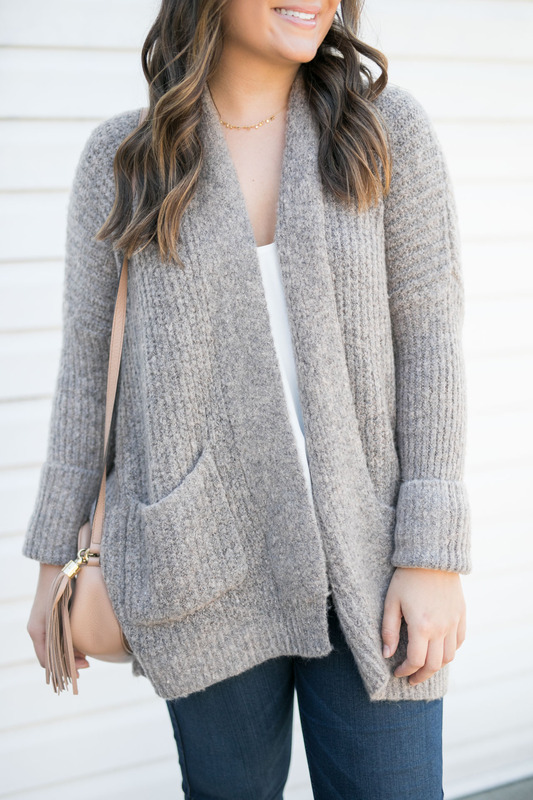 This neutral fall cardigan is seriously one of my favorites and is probably cozier than any blanket I own! Currently, it’s on backorder but you can order it and receive it within a month. It’s one of those cardigans that you will need because it’s that good. I love how you can cuff the sleeves or leave them loose (I cuff them because I’m short) and how it really goes with absolutely any outfit. I’m currently waiting for the movers to get here with all of my stuff so I’m super sorry for having a short post today! As you can imagine, a move is really stressful. I’m already tired and my stuff hasn’t even gotten here yet… haha! I’ll keep you guys updated on InstaStories so make sure to follow along. Can’t wait to share my new place with you once it’s more decorated (and once my furniture is actually inside of it). Also, just wanted to mention that these slides are still fully in stock and they’re my favorite. I wear them about every other day and love how comfortable they are and how they dress up any outfit with the jewels and beautiful blush color. Make sure to size up half a size, though! Have an amazing day and thanks so much for stopping by! Shop more of my favorite cardigans/sweaters below. this cardigan looks so cozy! you can’t go wrong with a neutral cardigan for fall! What a cute and cozy cardigan! You look so cute! PS – Your shoes are darling! This cardi is perfect and I love these shoes!! so involve with Fall cardigans, this one is perfection! I need this cardigan! It looks so comfy! Love the color of that cardigan, so perfect for fall! Your flats are so cute and look perfect with your outfit. Perfect for fall! That cardi looks so cozy but those slides!! They are the freaking cutest! that cardy is great and can we discuss the shoes? !